Muhammad had a knack for recruiting the wealthiest people to Islam before bothering with the poor. Like the first person to convert to Islam (Khadija) the second person, Abu Bakr, was also very wealthy. Abu Bakr was a rich cloth merchant (an early fashion designer, if you will) whose business trips took him as far as Syria and Yemen. But once he fell under the spell of Khadija and Muhammad, Abu Bakr became transformed into a jihadist Daddy Warbucks—the businessman who helped ensure the Prophet had the money he needed to raise an army to fight the infidel. Abu Bakr endeared himself to Muhammad by forfeiting all of his household wealth to fund the war effort. At one point, Abu Bakr slapped a Jewish rabbi in the face who questioned the Koranic verse 57:11 that suggested Allah needed a loan. Some have explained that the true reason behind the altercation was that Abu Bakr approached the rabbi to obtain a loan on Muhammad’s behalf, and the rabbi refused. Despite Muhammad’s love for Abu Bakr, the #1 companion faced difficulties too. The most notable opposition came from Fatima, the daughter of Muhammad, and her husband Ali. 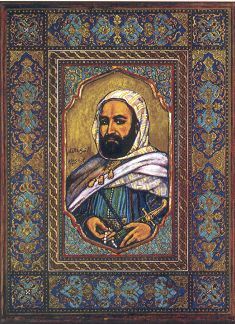 When Muhammad died, Abu Bakr seemed eager to retain Muhammad’s estate to propagate Islam, and fought off the attempts of Fatima to claim personal inheritance from her father’s ownership of an orchard at Fedak. In so doing, Abu Bakr basically imposed a 100 percent estate tax on the deceased Muhammad’s wealth and appropriated it for the needs of the burgeoning caliphate. The money grab/inheritance dispute between Abu Bakr on one side and Fatima Ali on the other would result in the Sunni-Shia split that has roiled the Islamic world ever since. Even after he was named the first caliph after Muhammad’s death, Abu Bakr continued earning income from selling clothes. Noting the unseemliness of this behavior, Muhammad’s #2 companion, Umar, arranged a salary for Abu Bakr. But Abu Bakr generally seemed more concerned about the treasury of Islam, the bayt al-mal, than with his own portfolio. He made his mark on the early caliphate by pledging to fight those who refused to pay zakat, rejecting the leniency his advisers urged. One author has written that under the circumstances of zakat non-payment, “It is not strange… that Abu Bakr and his government should have undertaken the killing of innocent Muslims and the destruction of their sanctity and the enslavement of their women and progeny.” No, not strange at all! Given Abu Bakr’s background of spending his whole adult life and net worth to help obtain early victories for Islam, it is little wonder he undertook a campaign to kill tax debtors who he felt were shortchanging the cause. interesting read… Having a muslim background myself, I have to say i have never heard these stories before. On the contrary, there are many accounts of the first four caliphs Abu Bakr in particular, suggesting that they lived very simple and modest lives. Shia-Sunni conflict is never ever connected to dispute over some orchid. Khadijah was Muhammads wife and Abu Bakr was his best mate, they were sure to convert to Islam. Many of the first muslims were poor including slaves and the oppressed. There were very few wealthy people, even Muhammad’s uncle… the chief of Quresh refused to accept Islam. Perhaps you should click on the links. even though I am ex muslim and have no interest or sympathies with islam, I hate to say that you are a hypocrite who demonize even the innocuous aspects of a religion. Most of the links you shared have no authenticated references. You claim with absolute certainty that Abu bakr was eager to get a hold on Muhammads estate. Its ludicrous how you attribute the Shia-Sunni conflict to dispute over an orchid. •	For Abu Bakr’s background as a merchant and as a neighbor of Khadija in Mecca, see The Life of Moḥammad from Original Sources, by Sir William Muir and Thomas Hunter Weir. •	Abu Bakr gave 100 percent of his wealth for Islam–that comes from Sunan Abu Dawud, Book 9, No. 1674, and most Islamic sources explain this donation was to fund the impending Battle of Tabuk. •	Abu Bakr pledged war against defaulters of zakat as described in the Sahih Muslim, Book 1, Number 29. •	The property dispute between Abu Bakr and Fatima is very well documented, perhaps most notably and reliably in the Sahih Muslim, Book 19, No. 4354. I am most surprised, Zodiac, that you would be so dismissive of the inheritance dispute over the orchard at Fedak—a well-known event among those with a basic knowledge of Sunni and Shia history. Stay tuned, Zodiac. We’ve got a post planned for Sunday that will go further into the details of Muhammad’s estate at the time of his death. I think you’ll find that these conclusions come from the Koran itself and the Hadith. Send me an e-mail to remind me and I’ll post part of it with a link. Good stuff that. …I mean when you post it next Sunday. And, assuming you’re in the US, happy 4th of July. Much like the Quran, the Hadiths and any thing written about the Sunna, therefore, and references about Islam will eventually rely on those very texts and the Sharia jurisprudence and the subsequent fatwas by Sharia Jurors. BTW, the Quran wasn’t put to paper/parchment until about 300 years after Mohammed’s death, so how much of what is written is actually the truth and not pseudo-religious-political war manual? Don’t let the facts of the fascist aspects of Islam get in the way of truth. After all, there is only “one Islam”, right? Oh wait, 73 sects at last count, and a couple of them condemned to death by the OIC for being apostates…that is when other sects aren’t blowing themselves up to prove the schism of yours, and their cult, is more right than the other. So much death and so little peace in Islam. Where did it all go wrong? Oh wait, that’s right, Mohamed didn’t have a very good humanitarian track record to start with, so when an entire religion elevates Moe to the pedestal of Prophecy, well the result is as plain as the nose on your face.